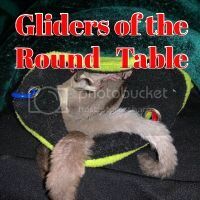 Register Log In GliderCENTRAL Forums Glider Things Pouches/Nest Boxes/Toys Vendor approved TOYS! Lucky You Gliders now has NEW toys available!!! Our toys each made to order by hand. You can choose your own colors and characters so each toy is custom to you. Our toys are vendor approved, safe, and durable for your pets enjoyment. They make great enrichment for not only sugar gliders but small birds and exotics as well. Check out my shop to order today. 10% OFF all orders + FREE SHIPPING on orders over $60!!! Let's kick these sales off with a bang with 15% off the entire shop!! Lucky You Gliders toys TAXMAS SALE!!! Our toys are made to order by hand. You can choose your own colors and characters so each toy is custom to you. Our toys are vendor approved, safe, and durable for your pets enjoyment. They make great enrichment for not only sugar gliders but small birds and exotics as well. Check out my shop to order today.